Ever since the day after Thanksgiving in 1960, when “CBS Reports” aired a documentary called “Harvest of Shame,” the exploitation of migrant agricultural workers has been a national scandal. Farm workers—then and now—live at or below the poverty level and depend on their meager income to feed their families here, and often to support relatives in their home country as well. More recently, the corporate successes and excesses of NAFTA have brought nothing but impoverishment to Mexican workers, both in their country and in the US. While large transnational corporations profit hand-over-fist from free trade, slack regulation, and abundant and cheap Mexican labor, hundreds of thousands of displaced people—from cities, towns and villages—are forced to head north in order to survive. On this side, the Mexican migrant workers, many if not most undocumented, have nowhere else to go. Eve Bunting’s Going Home was published 35 years after “Harvest of Shame” was aired, 33 years after the United Farm Workers was founded, and two years after NAFTA was enacted into law. So one might think that Bunting would have had plenty of information about how agricultural workers and their families live—if she had looked. Apparently, she didn’t. 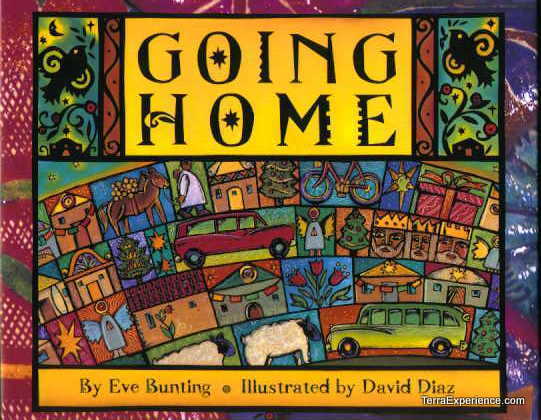 In Going Home, the young narrator, Carlos, finds out that he and his farm worker family will soon be “going home” to La Perla, Mexico, for Christmas vacation. “Home is here,” his mother explains, “but it is there, too.” Well, I would bet anything that no agricultural workers in their right mind would refer to a labor camp as “home.” Turn two pages: “Papa locks the door of our house,” Carlos says. “The house really belongs to Mr. Culloden, the labor manager, but it is ours as long as we work the crops for him. It has been ours for almost five years.” On the facing page, the artwork depicts this farm worker family’s “home” as one in a row of suburban tract houses, with neatly manicured lawns—as far from a typical ramshackle labor camp domicile as Santa Barbara might be from Appalachia. Papa tells the children that they are “legal farm workers,” so they will have no trouble crossing the border. Well, that’s convenient—not only does Bunting neatly avoid describing the incidences of harassment, arrest, jail and deportation common at border crossings, she also does so by having Papa explain why: This family is “legal.” The world is good. Then there is the peppering of Spanish words in the text—“sí,” “mijo” [sic], “papeles”—coming from the parents. Carlos explains to the reader that, “Papa speaks always in Spanish. He and Mama have no English. There is no need for it in the fields. But I’m always trying to teach them.” But. Since there are only a few Spanish words in the entire text, everyone appears to be speaking English. And Carlos is correcting Papa when he says a word in Spanish, which Mexican children do not do because it would be rude. Rather, children learn early on how to code-switch, an important skill in a household where the parents speak one language and the children speak two. This is all different from teaching the parents English or interpreting when interpretation is needed, a subtlety that is lost on Bunting. And I’m not sure why Bunting decided to use Spanish grammatical forms in Carlos’s English, either. This whole language thing is just a mess. Carlos says that he and his sister know “how hard the work is. The heat in the strawberry fields. The sun pushing down between the rows of tomatoes. The little flies biting our faces. We know because we work, too, on weekends and school vacations.” In truth, children often work alongside their parents in the fields—before and after school, when they are fortunate enough to be able to attend school—as well as weekends and vacations. While federally mandated Migrant Education Programs exist, children living in rural areas often do not get to go to school. And despite the existence of child labor laws that vary from state to state, children are often forced to work under a parent’s name or under an alias. It’s a dirty business, but one that Bunting conveniently ignores. Why did Carlos’s family come here, then? “We are here for the opportunities,” Papa says. More likely, the children would not ask, because they would know. Toiling in the fields as migrant agricultural workers is hardly done for the “opportunities”—it’s done for survival and possibly to send some money home. Nicely done, Beverly. Bunting's books strike me as ones that support the master narrative about the United States - land of opportunity. Just work hard, be honest, and keep hope alive. But her books seem lazy and deceitful to me, the opposite of what the master narrative purports to advance. Thanks so much for this! I am reading Sarah Warren's Dolores Huerta: A Hero to Migrant Workers this week, and I was looking for additional resources to talk about her, labor, organizing, and unions with my kiddos. Your reviews of the 3 books relating to her work are invaluable!